BRATTON…Amazon buying Del Mar and The Nick?, Greg Larson supporters, West Cliff Drive & Bay street development, Monterey and De-Sal, Good Times apology, KSQD update. GREENSITE…Gillian is traveling. No piece this week. KROHN… is also “off this week, but he will be back with news and views from the Santa Cruz city council, next week”. STEINBRUNER…Planning dept. to increase dense developments, Public Works Director and disconnect, Soquel Water District and public comment time and being forced to reduce rates and to install Smart Meters. Gary Lindstrum a great candidate for Soquel Water Dist. PATTON…and Delegative Democracy. EAGAN…Subconscious Comics and Deep Cover.JENSEN…her secret and James Aschbacher’s event. BRATTON…critiques Puzzle, Alpha, Crazy Rich Asians and Never Goin’ Back. 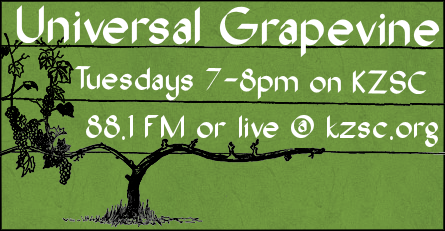 UNIVERSAL GRAPEVINE GUEST LINEUP. QUOTES…about BORDERS. 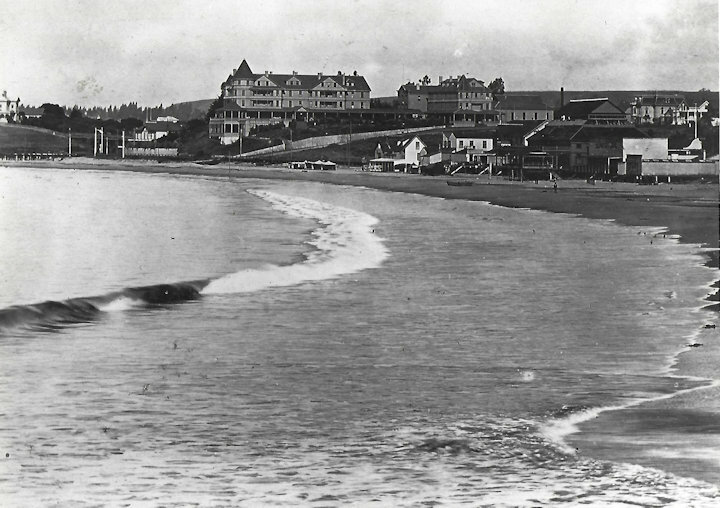 THE ONCE FAMED SEA BEACH HOTEL. The photo was taken in 1890. The hotel, which was designed to attract tourists here instead of Carmel, was built in 1870. It burned to the ground on June 12, 1912. AMAZON BUYING OUR LANDMARK THEATRES? At first I was very worried to hear from Joe Blackman that Amazon was “thinking and not responding” to rumors that they might buy the Landmark theatre chain. We should remember that Jim Schwenterley and Bill and Nancy Raney lived here and had a wonderful and genuine ability to judge which films would “go over” in Santa Cruz. They ran our three independent movie theatres (Aptos included) with insight and concern. Landmark, with 52 theatres and 200 screens, books by numbers as we’ve experienced.. Read the Chronicle or any film online page and see just how many great independent, art and foreign films we have been missing since Landmark took over. So maybe Amazon would be different? Maybe even better? We really don’t get to say much…or even vote on it, but just maybe? GREG LARSON AND SUPPORTERS. With high profiled Greg Larson entering the City Council race, naturally everyone wants to know where he stands on issues. Next time you see him, ask him how he’d vote on the West Cliff-Bay Street Development or how he’s going to vote on the Rent Control measure. I’d be very surprised if you get a straight answer on either one of those. Take a look at who we know supports him already: Hillary Bryant, David Terrazas, Fred Keeley, Richelle Naroyan.and Geoff Dunn. Most bets are saying he’ll be right in the middle of the Council and will support all the proposed development and growth, just like his friends and supporters. WEST CLIFF DRIVE & BAY STREET DREAM INN DEVELOPMENT. Neighbors, environmentalists, hundreds of concerned citizens are gearing up for a genuine battle against the proposed development by Ensemble Real Estate Investments. They are going full steam on their huge commercial/residential development across the street from the Dream Inn. Traffic at that corner has always been a serious problem and with this four storied distraction it’ll be nearly permanently grid locked. They also plan on a two story underground parking lot. How tourists and residents will be able to drive into that underground space has yet to be determined. Stay tuned…and involved!! MONTEREY, MARINA AND DE-SAL. If you want to bring back some de-sal memories read this article from the Monterey County Weekly… think about Bill Kocher and those days. GOOD TIMES & APOLOGY. Dan Pulcrano the CEO and executive editor of Metro Newspapers emailed to tell me that I erred in stating that “Ownership” of Good Times had changed. I knew better, I was careless in using that word. Dan is now listed as publisher of Good Times. Metro Newspaper Group acquired Good Times in 2014. Dan tried to get a job with Jay Shore’s Good Times back in 1977 but was turned down. That was about the time that Jay Shore and Neil Coonerty co-owned Lulu Carpenter’s Café now a coffee house up there on Pacific avenue, next to Barry Swenson’s development. KSQD UPDATE. I mentioned last week that KSQD fm would go on-air Sept. 1st. Nope, according to a press release they immediately sent out they’ll go on air and live “this October”. They also sent out a on air schedule listing some very familiar names of the new programmers. That includes Wallace Baine, Jim Emdy,Charlie Lange, Leigh Hill, Rachel Goodman and quite an impressive longer list. They are apparently still dealing with tower leasing problems with UCSC. Then they’ll purchase their license and start the building of their studios on Encinal Street. BERKELEY’S BRENNAN’S TO CLOSE. Larry Peterson sent this one…Berkeley standby Brennan’s Irish Coffee & Restaurant is closing on September 15 after 60 years of business. I lived there and was going to U.C. Berkeley when Brennan’s first opened in 1958. Along with Larry Blake’s Rathskeller and Spenger’s those drinking establishments were an integral part of our lives. Read this …if Brennan’s rings your bells. More of the story here…”Brennan’s, the decades-old family-owned Berkeley hangout, will close on Sept. 15. Brennan’s is celebrating its 60th anniversary this year. The hofbrau-style joint joins a growing list of East Bay landmarks that have shuttered over the last few months — Hs Lordship closed after 50 years in July, and Oakland’s Mexicali Rose lasted 91 years before bidding farewell in June. According to Margaret Wade, the granddaughter of John Brennan who built the Berkeley hangout in 1958, the closure is a sign of the times. “We have a 25 percent rent increase coming in October,” Wade said. “Everything when it comes to the expenses associated with running a business just goes up and up”. SANTA CRUZ POTTERY TO CLOSE. Joel Magen opened the Santa Cruz Pottery in 1974. It’s that fine looking brick building at Mission and Olive streets (on the corner next to CVS). Rumors have it, and I’m still working on it, that Kevin and Nina Wahl the present owners are having problems with the lease. Stop by, buy some pottery and find out the real story. Gillian is traveling. No piece this week. Chris Krohn is off this week, but he will be back with news and views from the Santa Cruz city council, next week. THE QUALITY OF LIFE FOR SANTA CRUZ COUNTY RESIDENTS IS BEFORE THE COUNTY PLANNING COMMISSION THIS WEDNESDAY 8/22. The County Planning Commission will hold a Public Hearing and consider the Planning Department’s proposed changes to County General Plan and Zoning Codes that will allow very dense developments throughout the County and change the way it may be processed. Please attend the Hearing Wednesday, August 22, 9am, in the 5th Floor Supervisor Chambers at 701 Ocean Street. The quality of life as we know it in Santa Cruz County will drastically change with what the developers have cooked up here with the Planning Department without regard to the necessary infrastructure to support such dense growth. These significant changes, if approved by the Planning Commission and Board of Supervisors, WOULD ALL BE EXEMPT FROM THE CALIFORNIA ENVIRONMENTAL QUALITY ACT (CEQA) PROCESS OF PUBLIC AND ENVIRONMENTAL REVIEW. Note the reasons for CEQA exemption on pages 100-101: “There would be no potential to create a physical effect on the environment” with the proposed changes. What?! The Planning Department is recommending the issues below be considered now by the Planning Commission in Public Hearing, but that other affordable housing issues (farm worker housing, permanent room housing in hotels & motels, and affordable housing projects on publicly-owned sites, i.e, the Consolidated Redevelopment Agency) require full environmental review and will be presented this winter. Allow up to 75% more units/acre if the development is 100% affordable. This exceeds the current State-required “Density Bonus” levels of a 35% density increase for affordable projects. The current County cap on density is 17.4 units/acre. The proposed 75% density increase would allow 31 units/acre. Wow. Change the process to initiate re-zoning for R-Combined Districts that can be even denser development with reduced setback requirements from neighboring property boundaries and possible parking reduction requirements. This would allow disgusting ghetto developments such as the Aptos Village Project to go up all over Santa Cruz County, with the ability of the developers to identify the locations for these new R-Combined Zones. This could be done, like the Aptos Village Project that Swenson has created, with a Planned Unit Development (PUD) agreement, which basically allows the developer to disregard most of the County Codes that specify setback, density, building footprint/lot size ratio (floor area ratio or FAR), parking requirements, and curb turning radius for emergency vehicles. According to the staff report, under these proposed developer-initiated actions, “it is anticipated that the areas will probably be smaller infill sites”, and not the larger subdivision sites the County apparently identified in 2007/2008 work. Hmmm…was that the pre-cursor of the Sustainable Santa Cruz County Plan that is still undergoing environmental review in the Planning Department? Change the inclusionary affordable housing requirements to require any development of seven or more units to get Board of Supervisor approval to pay the in lieu affordable housing fee instead of actually building it in the development (right now, as of 2015, the developers can arbitrarily decide what to do) but if the Board approves the in-lieu payment option, the developer would not have to actually pay the fees until the final building inspection is signed off. That could be a really long delay in actual payment to the County for affordable housing to get built, and the cost of building that housing would most likely have increased substantially. I have attended the County Housing Advisory Commission meetings when developers and real estate agents showed up to lobby the group to recommend these developer-friendly proposals to the Board of Supervisors. There were many questions and some hesitation on the part of some of the Commissioners, but eventually, everyone approved it. Here is a link to the audio file for that meeting. Contact the Planning Commission and your County Supervisor and let the know your thoughts. Attend the Planning Commission Public Hearing if you can. Hmmm….I wonder how the public was notified of this Public Hearing? I was sent a notice by the Planner Suzanne Ise (suzanne.ise@santacruzcounty.us). I suggest you get on her notification list, too. I am very grateful for the new County Public Works Director, Mr. Matt Machado. He is refreshingly responsive to the public (even mine!) and seems to be accountable for what happens within the Public Works Department. In the recent Santa Cruz Sentinel interview, Mr. Machado admitted that there are some issues to be smoothed out regarding the disconnect with the Planning Department development policies. Here is the link to that article: Santa Cruz County’s new public works chief sets sights on outreach, overdue repairs. Contact the District and demand that Public Comment be extended 15 days for the PureWater Soquel Project Draft EIR because it is the public’s legal right to have more time to review such complex documents that impose significant negative impacts. Comments can be submitted via email to purewatersoquelceqa@esassoc.com or via mail to Pure Water Soquel Project CEQA, 4041 Soquel DR, STE A-501, Soquel, CA 95073 -3105. Many people requested that Soquel Creek Water District extend the Public Comment Period for the PureWater Soquel Project Draft Environmental Impact Report (EIR), but District General Manager Ron Duncan REFUSED TO HONOR THE PUBLIC REQUESTS and posted such on the District website August 10, 2018…three days before close of Public Comment Period. He stated at the District’s Public Outreach Committee meeting, August 14, that he felt the delay to the Project that would be caused by extending Public Comment time did not warrant the estimated $14/service connection that the delay would cost reatepayers, and that many of the requests for more time were not made by District ratepayers. What? Since when does any California Environmental Quality Act (CEQA) process get so restricted in disregarding the general public? Since when can Ron Duncan disregard requests from people who could be negatively impacted by the Project’s construction of 11 milles of pipeline from the Santa Cruz City Wastewater Treatment Plant on Bay Avenue all the way to the proposed West Annex Treatment Facility at District Offices in Soquel Village??? Although I am not a CEQA law expert, it seems the District may have VIOLATED CEQA PROCESS. Whatsmore, with the tone of Ron Duncan’s statement, how can anyone be expected to believe the District Boardmembers’ continual claims that they have not yet decided whether they will pursue the $183+ MILLION PureWater Soquel Project to pump treated sewage water into the region’s drinking water supply? Don’t you think people who would be affected should be able to vote on this??? Soquel Creek Water District Board members had earlier told some members of the public that there would be a Protest Ballot action made available to ratepayers before any Board action. That all seemed to go away after the recent District staff and Board members went to Washington, D.C. and Denver (how much do you think THAT trip cost ratepayers?) to meet with federal reps. about getting a grant. Now, the District’s focus is GET THE MONEY. Thanks to legal action brought by District ratepayer Mr. Jon Cole, Soquel Creek Water District must hold a Public Hearing to discuss a court-mandated Ordinance #18-01 to reduce Tier 2 rates and monthly private fire protection service fees, effective July 1, 2018. This is scheduled for Tuesday, August 21 as Item 2.2 (pages 15-20 in the agenda packet). I hope that ratepayers will demand the Board approve this Ordinance rather than appeal the legal action. If the Board decides to appeal the Writ of Mandate, the District will continue to collect the INVALID FEES until the appeal process is complete. That would not only mean ratepayers continue to pay unjust fees, but also pay thousands more dollars for District’s legal counsel to fight it. If you are a ratepayer, contact the Board and let them know your thoughts. Remind them about their re-election on November 6, too. The District will hold their SIXTH Special Board meeting Tuesday, August 21, at 5pm, to consider how to pay for the PureWater Soquel Project. District Financial Manager, Leslie Strohm, will offer recommendations about which Capital Improvement Projects to postpone, and how to raise rates to pay the expected $183+ MILLION expense for construction. What about the expensive operating costs? One way to help get more money from the Budget is to call Smart Meters a water conservation measure, and thereby use some of the $3 Million the District has amassed from Water Demand Offset fees to new service connections. WHAT ABOUT THOSE INVALID FEES WRIT OF MANDATE THAT A RATEPAYER RECENTLY WON IN SUPERIOR COURT? The District Board and Staff are clearly not being responsible stewards of ratepayer funds. I am delighted that Mr. Gary Lindstrum, long-time Aptos resident, retired businessman and veteran, is a candidate for the Soquel Creek Water District Board election. He has been active in many local issues, but most notably with Water for Santa Cruz County, a group advocating regional water transfers with Santa Cruz, rather than the expensive and risky PureWater Soquel Project. Gary has great personal integrity and a common-sense attitude that is refreshing and responsive to the serious financial problems looming before the District. SANTA CRUZ WOMEN’S DEMOCRATIC COMMITTEE HOLDING CANDIDATE FORUM THIS SATURDAY 8/25. Attend this public Candidate Forum August 25, 9:30am, at the Santa Cruz City Police Community Room (155 Center St.) and hear discussions from candidates for the Santa Cruz City Council, 4th District County Superivsor, Watsonville 4th and 7th District City Council, Santa Cruz City School Board Areas 1 and 2, Santa Cruz Port District, and Soquel Creek Water District. Because this is primarily a Committee endorsement forum, only candidates who are registered Democrats are invited to participate. Happily, the Santa Cruz Democratic Women’s Club corrected their oversight and invited Gary Lindstrum to participate as a candidate for Soquel Creek Water District Board. Here is the link for more information about other events, including an Initiative Forum on August 27, 7pm, same venue as above. American democracy is built, in large part, on an assumption … that the three branches of government would jealously guard their power and co-equal status. It’s a reasonable thing to assume. People — particularly politicians and judges — like having power and status and generally aren’t keen to give them up. Human nature, the founders reasoned, would naturally lead the branches to check and balance one another, as much out of self-interested competition as constitutional duty. As the Newsletter notes, “that assumption is looking a bit shaky these days.” It asks, “What happens if that foundational democratic assumption in the separation of powers collapses? 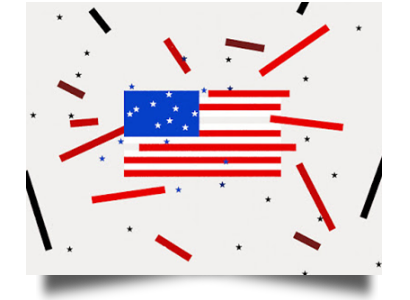 What would American democracy become?” The answer, according to the Newsletter, is delegative democracy:”Delegative democracy is an old concept in political science,” Amy Erica Smith, an Iowa State political scientist, told us. It emerged after a series of Latin American dictatorships transitioned to democracies in the 1980s — but to a sort that seemed less than fully democratic. “There was this collective head-scratching over what sort of democracy we have in Latin America,” said Dr. Smith, who studies the region. “We had free and fair elections that met the minimum criteria for democracy. But they didn’t look exactly like what we think democracies are supposed to be.” The key difference, the experts decided, was separation of powers. It existed on paper in Latin America democracies, most of whose constitutions were modeled on that of the United States. But, in practice, the courts and the Congresses did what they were told. They delegated their power to the president — hence, delegative democracies. These countries, for the most part, were still democracies. But they didn’t function all that well. They had what’s called “vertical accountability” — leaders had to answer to voters, who could kick them out of office — but not “horizontal accountability” from other branches of government. That tends to degrade governance. There’s little to keep the president from putting her interests first. Corruption and abuses of power become more common. Apolitical agencies get politicized, hurting their ability to function. The president’s support base tends to get preferential treatment; those not in her support base can face discrimination or worse. The Newsletter also denominates this phenomenon as the “presidentialization” of political power. We are definitely running into a possible problem here, and the essence of the problem is that a system that was supposed to keep our government responsive to voters organized on a local basis, through the 435 different Congressional districts spread throughout the fifty states, has become ever more “national,” and the “national” elected official who is most prominent is, of course, the president. The way to make sure we don’t end up with some kind of “delegative democracy” is by making sure that our elected representatives in Congress actually represent their local constituents, i.e., the people who live in their districts. Our system of representative democracy is intended to make representatives respond to their local constituents, but it has become ever more “nationalized,” and that kind of “nationalized” Congress is ever less willing to check presidential power, which also operates at the national level. More and more, our Congressional elections are presented as “national” contests. We read in our local newspapers about Congressional elections taking place in far-flung states we know very little about, and we get funding appeals from those running for Congress in those states, in places we may never have even visited. Not to deny that every Member of Congress will vote on issues that will affect everyone in the country; that is certainly true. But our system is built on the idea that local people will be able to “terrorize” their local elected representatives, and make those representatives accountable to their local constituents (and not to some national political party). We have a problem, and it’s not just in Houston. It’s everywhere. Delegative democracy? I think that’s an oxymoron. If we want the kind of democracy that our Constitution contemplates, we can’t delegate our control over our own elected Congressional representatives to anyone – not to a national political party, and certainly not to the president! EAGAN’S SUBCONSCIOUS COMICS. 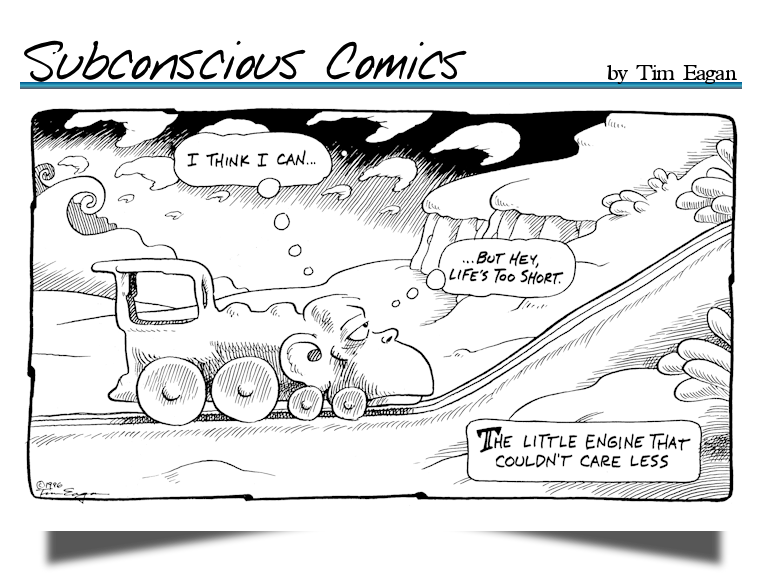 Check out the new classic Subconscious Comic just a scroll downwards. EAGAN’S DEEP COVER. 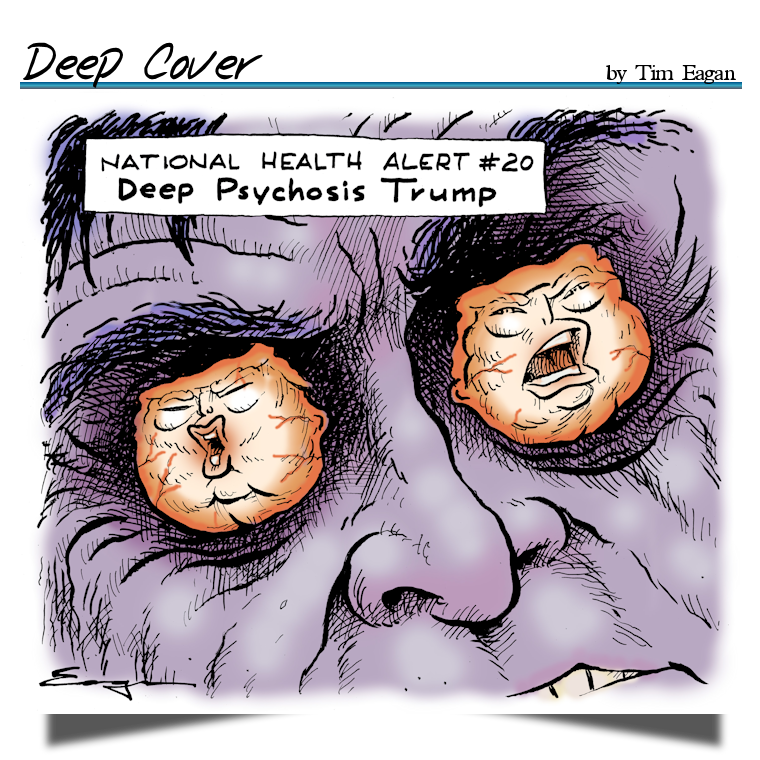 See Eagan’s ” Deep Psychosis Trump” as part of his national Health Alert series #20 down a few pages. As always, at TimEagan.com you will find his most recent Deep Cover, the latest installment from the archives of Subconscious Comics, and the ever entertaining Eaganblog. SAN FRANCISCO MIME TROUPE’S “SEEING RED”. We are really fortunate that the San Francisco Mime Troupe continues to make Santa Cruz one of their traveling stops. They’ll be performing their original time – traveling musical “SEEING RED” twice in San Lorenzo Park for free. That’s Saturday/Sunday September 8th & 9th. The great Mime troupe band starts at 2:30 the play is at 3 p.m.
LISA JENSEN LINKS. Lisa writes: “Everybody keeps telling me how brave I am, after the unimaginable loss of my Art Boy. It’s not true, but I do have a secret weapon against too much sadness! Find out what it is this week at Lisa Jensen Online Express (http://ljo-express.blogspot.com ). And don’t forget to join me at the Rio this Saturday, August 25, to celebrate James Aschbacher’s inspiring life!” Lisa has been writing film reviews and columns for Good Times since 1975. PUZZLE. A perfectly acted extra sensitive story of a woman finding her way to emporment. Also a view into the little known world of Jigsaw Puzzle addicts and experts. Go see this quickly, it probably won’t last long on Santa Cruz screens. CRAZY RICH ASIANS. A Hollywood movie with an all Asian cast. It’s about the same as “My Big Fat Greek Wedding”, except Asian Americans instead of Greeks. The plot, laughs, and acting are all typical Hollywood re-hash. It doesn’t need your ticket money…it’s breaking many, many box office records already. Which means of course that there’ll be a dozen look a like sequels. Holland, Hungary, Berlin, Austria, Denmark and Atlanta, Georgia. After more than two hours those locations plus the foolish, overused dialogue between the two women aren’t enough to make this flick worth paying to see.